Flaming heart make my heart skip a beat. 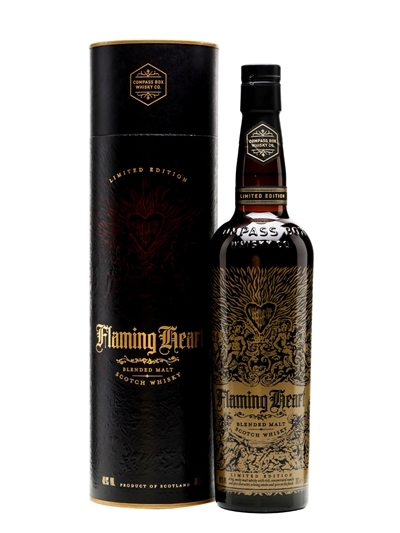 Compass Box are back with the fourth release of their Flaming Heart Blend produced to celebrate fifteen years of Compass Box wand waving. This is a blended Malt so no Grain whisky in here and it’s made up of four components, although this is an nas whisky it sort of isn’t because I got a wee card telling me what whiskies are used and their ages so that’s nice. Okay so no other waffle other than it’s bottled at 48.9% with no chill filtration and natural colouring which I like. Nose. Charred wood, bbq coals, orange boiled sweets, sea breeze, a touch of oregano, salty crisps. I liked a drop or two of water with mine, really brought out the nose. Palate. Smoke again but it’s not a harsh dram, Creamy fudge, oily (especially with water), some crisp green apple but also some stewed berries too, something nutty. Finish. Stays for a while, a smoky, peppery whisky with a hint of brown sugar. So aye, a very decent dram indeed, yes this is expensive and it’s right at the limit for what I’d pay for a bottle of whisky but it’s an accessible whisky, as long as you like your smoke. This would go well with blue cheese for sure. Oh and that’s once again to Chris at Compass Box for the sample.